Tivo_Kenevil wrote: What we really need is more affordable and/or micro units. For the fourth consecutive year, Big D NYE is "on hiatus," confirms event executive director Jim Glass. The New Year's Eve celebration that took place at the doorstep of American Airlines Center, in Dallas' Victory Park, will not take place on Dec. 31, 2018. Fair Park seems like the only possible location for something this big. Is the Hines Victory Park office building that was supposed to go just north of One Victory dead? It has been on the books for years (maybe since 2015?) and it always seems like it is 1 year out from starting up. I never really understood why they didn't move this to Fair Park. FP does fireworks on Fourth of July and every night of the State Fair. Was there some other logistical problem related to broadcasting the event? 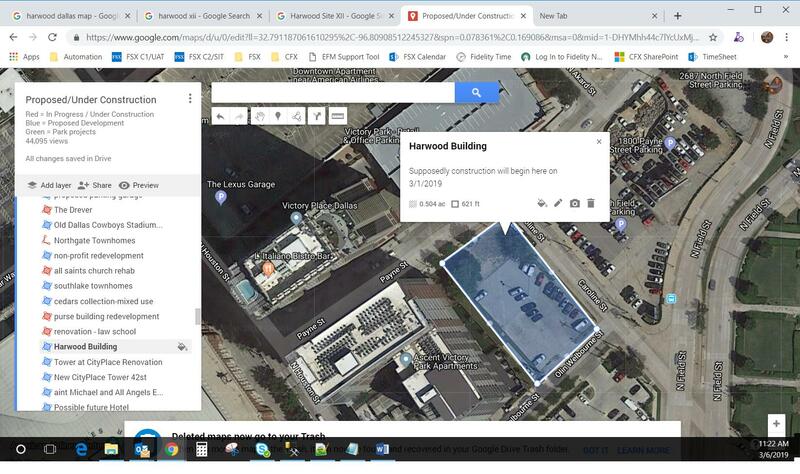 homeworld1031tx wrote: Is the Hines Victory Park office building that was supposed to go just north of One Victory dead? It has been on the books for years (maybe since 2015?) and it always seems like it is 1 year out from starting up. It just needs a new tenant. Would not be surprised to see another large law firm take this and make a presence in the future. Biagio Wine and Spirits: under construction. Richardson Bike Mart: coming soon. These are positives because the VP owners are brininging in retailers that will make this more of a livable neighborhood, and less of a destination for North Dallas tourists. I went for a walk through Victory Park on my lunch break yesterday. Usually, I walk through AAC, crossing the plaza. When I approached the steps to the plaza off Olive St, I noticed the center is putting huge concrete planter boxes there along with a "NO TRESPASSING" sign prominently displayed; pretty much blocking that entrance to the center (you can walk between the boxes, but it doesn't look inviting). I walked across the plaza anyway. When I walked to Houston street I was met with huge concrete blocks with "NO TRESPASSING" signs separating the AAC from the street. Why is there such an effort to separate the AAC from the neighborhood around it? Seems quite the opposite of a walkable neighborhood and a step backwards for Victory Park. vman wrote: I went for a walk through Victory Park on my lunch break yesterday. Usually, I walk through AAC, crossing the plaza. When I approached the steps to the plaza off Olive St, I noticed the center is putting huge concrete planter boxes there along with a "NO TRESPASSING" sign prominently displayed; pretty much blocking that entrance to the center (you can walk between the boxes, but it doesn't look inviting). I walked across the plaza anyway. When I walked to Houston street I was met with huge concrete blocks with "NO TRESPASSING" signs separating the AAC from the street. That seems pretty strange. Could it be that the boxes are just temporary for something? Doesn't make a whole lot of sense any way you slice it, but that's the only possibility that comes to mind. vman wrote: That seems pretty strange. Could it be that the boxes are just temporary for something? Doesn't make a whole lot of sense any way you slice it, but that's the only possibility that comes to mind. I'll look again next week, but from what I could tell, there was piping in the bottom of them for water, so they seemed permanent (I hope not). Dibs on Victory's food can be explained through its chicken wings: They come served dipped in Buffalo sauce, mopped in barbecue sauce, rubbed with Doritos Cool Ranch, or flavored with edible 24-karat gold. You've got traditional, Texified, wacky and sophisticated. That might describe the clientele at Dibs on Victory, too. This big, two-story bar comes from Brandon Hays and Phil Schanbaum, who have operated Dallas haunts like High Fives, Ferris Wheelers, Wayward Sons and So & So's. Dibs is a quick walk from the American Airlines Center, home to the Dallas Mavericks and Dallas Stars, and Hays and Schanbaum hope to create "a culture around the game." According to this article, this venue should be open sometime this month. They seem to be pretty successful with most of their other establishments (with the exception of So & Sos), so I feel like this is the type of place Victory Park will need. Also, I believe I heard that Hero should be opening within the next month or so as well, but I can't seem to find any solid information on that one. I really think both of these will be a big enough hit to really start to draw some bigger crowds to the area, especially once the weather starts warming up again. The Mavs being competitive again will surely draw the wing bar crowd. I'm not sure if this would be considered Victory Park, but I saw this sign on the Katy Trail right outside the Alexan apartments. Looks like we will be getting a placed called "Local: Tap a Table" over here. Good lord I wish them luck but that space is such a total destination with no access other than walk ups from the Katy Trail. I hope they got an incredible lease based only on sales. Oh, I used to live in that concrete behemoth. 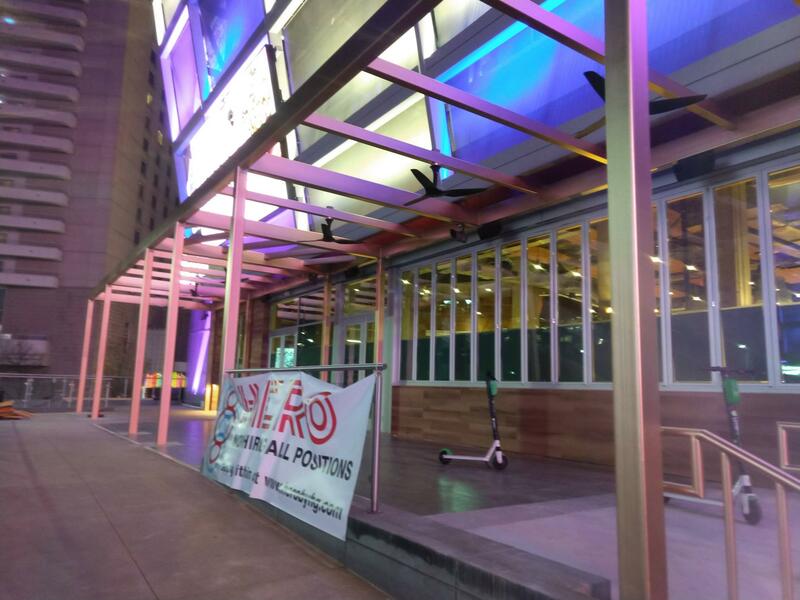 I wish them luck because this could be a great amenity for the trail, but even living in the building it was difficult to get to the restaurant space. That apartment building is poorly laid out. Cbdallas wrote: Good lord I wish them luck but that space is such a total destination with no access other than walk ups from the Katy Trail. I hope they got an incredible lease based only on sales. I was wondering how easy this venue would be to access, and it sounds like you answered my question. What an awful spot, indeed. This part of the trail isn't all that lively either, which makes things worse. If they needed to rely solely on Katy Trail traffic, I'd say they could potentially pull that off, if it were closer to the Katy Trail Ice House, as that section is always booming, but this location is usually not all that busy. The name seems like it was taken from one of those renderings with placeholder restaurants. Something even vaguely referencing Baby Doe's Matchless Mine would've been great! If that weren't possible, at least reference Goat Hill or the billboard in the name (Baby Goat Tavern, Waterfall Tap House, etc). Even Alamo Manhattan had the vision to name their Bishop Arts building after the founder of La Reunion, Victor Prosper Considerant. Was at VP around 8 last night. A lot of the plywood covering retail storefronts has come down. The Imoto entrance looks better now. There's also a new ramen place with a large patio next to the Cinepolis that looks like it will be opening soon. Thanks for the pictures, this area is really coming together! I really think places like Dibs on Victory and Hero will be able to draw a decent crowd on a regular basis, along with all the other establishments here that are open or are about to open. Dibs has got be the most pretentious looking wing bar ever. Chiming in to share that spouse and I went to the test run/soft opening of The Henry in VP. I genuinely have no idea how I got on their mailing list, but free food is free food. It was impressive. The Henry is very chic indoors and out, although overall it isn't really to my taste (I prefer cozy holes in the walls, and think 90% of Dallas restaurants are too big, with cavernous ceilings and no soft surfaces to absorb sound...I hate shouting at the people I'm sharing a meal with). But even though it was a cold and rainy day, so foot traffic was minimal, I was struck by how genuinely urban the entire experience felt. It's in a spot that's literally surrounded by new construction, with lots of cool-looking ground-floor retail going in. It truly did feel like an urban neighborhood that's about to pop. I really can't wait to see this area after the Tom Thumb is finished and the summer patio months get going. Something else that made me smile was that both the manager and our server (both in their late 20s, early 30s) were hatching plans to move from the 'burbs into VP, because they were so enthusiastic about the energy in the neighborhood. If anybody is interested, The Henry is run by the same company as Flower Child, so the food was imaginative and plant-heavy, although there are lots of pastries if you want to indulge. Really good. Last edited by emmasensei on 12 Feb 2019 14:59, edited 1 time in total. Thanks for the review, emmasensei. I definitely agree with you about the development feeling very urban, it's definitely what this area needs, and something that can still help tie the surrounding area together. Tivo_Kenevil wrote: Dibs has got be the most pretentious looking wing bar ever. To be honest, I don't know a thing about it, aside from the fact that it's coming from a team of people who have opened up some successful establishments in DFW (same with the people behind Hero). Sift & Pour, Hatchways and Burgundy Swine in VP are all making progress too. Harwood’s Mexican(?) Restaurant under construction by Happiest Hour is massive. Welp, for anyone worrying that the notorious Uptown crowd will be taking over Deep Ellum, it seems a beacon is starting to emit from Victory Park. Dibs, bros! 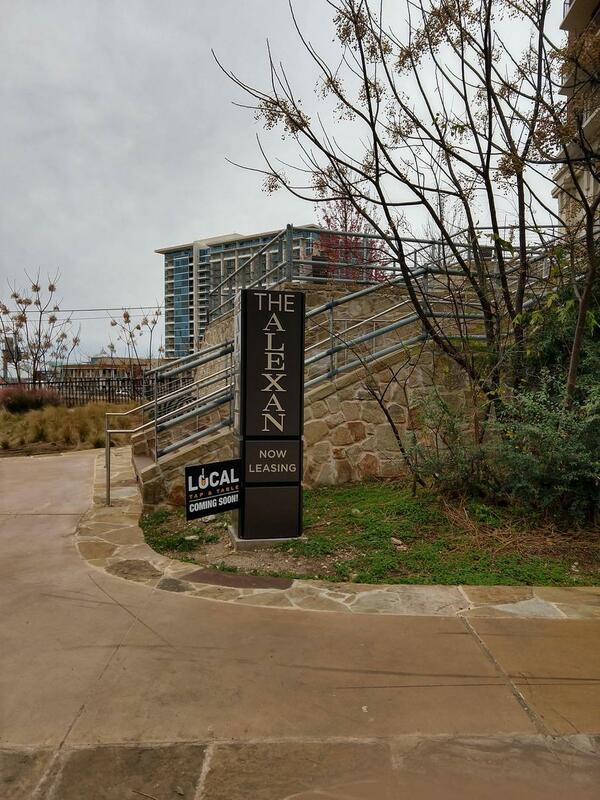 exelone31 wrote: Welp, for anyone worrying that the notorious Uptown crowd will be taking over Deep Ellum, it seems a beacon is starting to emit from Victory Park. Dibs, bros! We've even saying that for years..But Dunehill Partners keep sitting. I think they're waiting in the Trinity Project to be announced. It seems like all of the development is converging on the North End apts and El Fenix sites. Granite Properties' Cedar Maple Plaza, a 27-story office project on Cedar Springs Road across from the Crescent. The Link at Uptown, a 22-story office tower planned at Akard and Olive streets next to the new Union development. Hillwood Victory Park, a 15-story building with 374,000 square feet planned just west of American Airlines Center. For a second I thought the Hines development got a massive downgrade, but this Hillwood project appears to be north of the city parking garage at Victory Park. It wasn't mentioned because the article just focused on office, not residential. The Victor is just residential, unless you're referring to some other Hines office project? jetnd87 wrote: The Victor is just residential, unless you're referring to some other Hines office project? Least luxurious parking garage in Texas? tamtagon wrote: Least luxurious parking garage in Texas? The Hines 23-story Victory Park Center office tower has not started construction. It has been a proposal for several years. So, why is Hines proposing to build a second office tower in the same vicinity of the Victory Park area? Ya I was referring that bad boy which was first mentioned, what, in 2015??? Except that Block 71 is bigger and is actually happening. Nice look for downtown Austin. Here's hoping Hines has something different in mind for Victory Park. I like the neighborhood context created by the mid & high rises nearer the arena and plaza areas, but Victory Park really needs a skyscraper landmark. I'm actually a little surprised Hines office project hasn't moved forward. Clearly there is demand out there and VP could use another office tower. Hines is also proposing that office tower in Deep Ellum which I assume neither will happen unless a big office tenant signs up. Hey, guys. I'm new to the forum. Do you know what is planned for this block next to the Ascent Victory Park apartments? ^^ Have a look at the Harwood Forum thread. The rendering may be old since the one the thread refers to has been around for years, but it *appears* this is a 33 story tower. Looks like this place has signed a lease for Victory... It's a chain of award winning escape rooms. Looks pretty cool to be honest! A little entertainment option to bring people down to VP. I noticed it on the updated site plan. Kelley USA wrote: Looks like this place has signed a lease for Victory... It's a chain of award winning escape rooms. Looks pretty cool to be honest! A little entertainment option to bring people down to VP. I noticed it on the updated site plan. Very cool addition to the area. I still have yet to do an escape room myself, even though it's been on my list of things to try for a while. On a seperate note, I feel like the next evolution of the escape room would be the VR escape room. I feel like it won't be long before we see those come about. Walked through Victory Park tonight. Didn't really get a great picture, but this is the "Hero" establishment that is coming soon to the area. It still looks like there is a bit of work that needs to be done here, but it looked like a fairly large space, that will occupy a signifacnt portion of the ground floor of this building. It should really help to liven up the plaza once it does open. Also walked by "Dibs on Victory" which looked closer to completion. I'm pretty sure I read that place would be open in March, but I haven't really seen an update since then. “The Victory Park bar and restaurant scene is experiencing a dramatic change as we welcome new concepts from some of Dallas’ top food and beverage operators. Hatchways is not on the list for some reason, but it is coming along too. These tenants all look great—but I estimate that when the spaces at the House are included, VP retail is 50-60% leased. Let’s hope these are all successful and more tenants follow. How would you say VP is in terms of Neighborhood amenities? Nothing new announced here, just interesting that they are referring to the area as "South Victory". I guess maybe people associate "Victory Park" as being the place to go to watch NBA/NHL games, so perhaps they are trying to differentiate themselves from that image.